When current and resistance are given use V = IR to calculate voltage. When current and power are given use V = P/I to find the volts. Example #2: Find the voltage applied across an unknown resistor which dissipates 20 watts power while 5 A current is flowing through it. When power and resistance are given use V = √P*R to find the volts. Example #3: Find the voltage applied across the 200 Ω resistor which dissipates 20 watts power. When voltage and resistance are given use R = P/I to calculate current. Example #4: Find the current flowing through a 2.5 MΩ resistor when a potential difference of 20 V is applied across it. Here is another example of current calculation through a 47 ohms resistor. When power and voltage are given use I = P/V to calculate the amperes. Example #5: Find the current flowing through an unknown resistor which dissipates 20 watts power while dropping 10 volts across it. When power and resistance are known use I = √P/R to calculate the amperes. Example #6: A 15 kΩ resistor dissipates 5 watts power. Find the value of current flowing through it. When power and current are known use R = P/I2 to calculate the resistance. Example #7: Find the value of unknown resistor which dissipates 30 watts when 5 mA current flows through it. When voltage and current are known use R = V/I to calculate the value of the resistor. Example #8: Find the value of unknown resistor which drops 10 V when 25 mA current is flowing through it. When voltage and power are known use the formula R = V2/P for finding the value of the unknown resistor. Example #9: Find the value of unknown resistor which drops 10 V while dissipating 200 watts. When voltage and current are known use P = VI to calculate the value of the power. Example #10: The application of 10 V potential drop across a resistor results in 20 mA current flowing through it. Find the power dissipated across it. 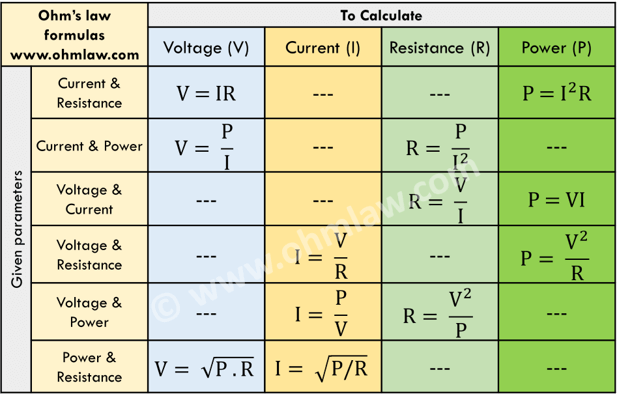 When current and resistance are known use P = I2R to calculate the value of the power. Example #11: 50 mA current is flowing through a 10 kΩ resistor. Find the power dissipated across it. When voltage and resistance are known use P = V2/R to calculate the value of the power. Example #12: A potential difference of 20 V is applied across 10 kΩ resistors. Find the dissipated power.